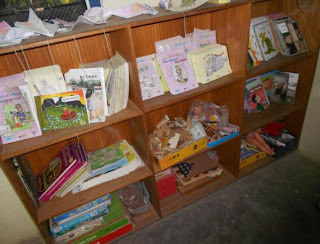 To this end, materials were developed for maths and more creative use. We are told that kids are not good at creating narratives or imaginative writing. They tend to respond only with yes/no answers. When asked to role play, they say "they made me change my name" or when asked questions they have difficulty answering in role and answer as self. If shown a cartoon of farm animals they are all called ‘toy’, not ‘pig’ or ‘horse’ (in Tetun), kids are reluctant to make ‘oink’ and ‘neigh’ noises etc. We observed kids in prep doing imaginative play with Lego in free play time. There is also a rich Timorese oral history of poetry (eg.). It is reasonable to assume that there is innate creativity but that the types of creativity we are expecting don't match what they are culturally attuned to. It is worth noting that kids are not being asked to create in their first language. The language at home is not Tetun, it is one of the other languages, possibly Mambai. The languages of instruction, Tetun and Portuguese are likely to be the second and third languages. It is also worth noting that East Timor has only recently recovered from war. Another possible issue, the novel didn’t appear till the 1700‘s and was then criticised as being trivial, maybe creative writing isn’t that easy and we shouldn’t be too surprised at the kids difficulty. Possible remedies, match the task to existing forms of cultural expression. An essay on "what I did in the school holidays" might be a poor match. Get kids to first role play with Lego and then create narrative. Show short videos to catalyse discussion, virtual soccer, video games. Try oral works, music, dance, art as bridging media. We did come prepared with some lessons which encouraged creativity but in the end mainly concentrated on math drill with Tuxmath and Gcompris, the creative lessons were too big a leap from the previous laptop use. 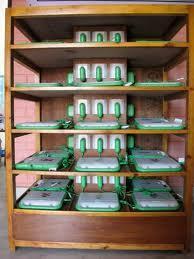 The original vision for OLPC was for child ownership and saturation in a situation where the education system was broken. The laptop was seen as a constructionist tool where unguided exploration would lead to experimentation and creativity. This deployment was neither child owned nor saturated. The school was functioning well and relatively well resourced. The feel was not dissimilar to a computer lab in a developed country. Moving from lower order skills to higher order skills (as defined in eg. Bloom's Taxonomy) is not an easy thing to accomplish in a developed world computer lab, why would it be any easier here? Laptops will be trialed with 2 kids per laptop in grade 3, previously the larger grade 3 had not used the laptops because sharing laptops was considered impractical. The children do not take the laptops home, we discussed the possibility of teachers taking the laptops home. Child ownership can extend further than the hardware, the child can also own their learning. The laptop was 'designed for collaborative, joyful, self-empowered learning'. Tom showed the TED Hole in the Wall talk which I think had a lot of impact. The laptops are shared between classes, each laptop has four 'owners'. The laptops are currently named 1,2,3 ... , we discussed the Chat Activity and allowing kids to rename laptops for a session. We discussed letting the children use Chat in an unstructured, free for all way. I have done that in the past, its chaotic and challenging for the teacher but has strong benefits for literacy. Mains power is erratic and had been off most days. 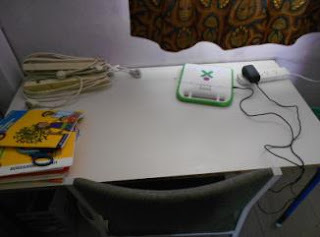 There is no classroom recharging, a tangled mess of leads and powerboards is impractical. Flexible furniture arrangement makes permanent power leads impractical. Multiple pendant leads are probably too expensive and still visually difficult. Need to try the laptops' automatic power management out to extend battery time. 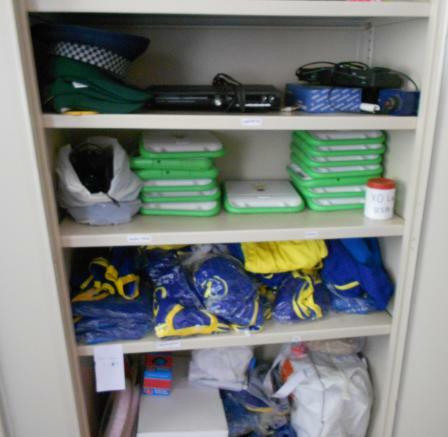 The laptops are stored in a locked cupboard in the principal’s office. They are charged on a table in the office in a tangled mess of power boards. Laptops stacked ontop of each other could overheat. Charging is hit and miss because of unreliable power. They are not left plugged in overnight, although they would charge if the power comes back on. This is maybe to reduce the risk of theft. Discussed having a lockable timber charging rack built. There was one XO1.0. It was software locked. We could not install the intended unsigned software image. We had been told that the Portuguese language was not required because the teachers expected computers to talk English. It turned out that was based on using the computer as an office tool. Once the range of Activities was increased, there was renewed interest in Portuguese. The school server opens up other uses, in part because it supports a directory based filesystem. Downloading the Tetun language Wikipedia now becomes practical. this deployment seems very different from the others I have read about. It seems cultural difference are at the heart of the issue of getting the kids to learn in a way that perhaps is 'western centric' in our way to art, literature and thought. Can you can access to example of literature and art that are from the surrounding region that the kids can inspect, compare, copy and critique? Puppet shows, religious stories, dance troupes, illustrated texts? Maybe they want to record audio rather than write?